I thought I'd talk about one of the most fffabulous splurges I've done lately. I went to Lisa T.'s private party last May and fell for the most gorgeous chain and diamond cross pendant; but I didn't feel too bad for two reasons: 1. it is drop dead gorgeous and goes with everything; it nicely dresses up any Sharon Segal tee I wear, and it even looks great with a white tank top and sweatpants on weekends; and 2. my friend Masami bought a superb morganite (light pink) and diamond platinum cocktail ring, which she wears every single day; she gets complimented for it all the time. So worth it! Check out the Lisa T. fine jewelry website; you'll fall for any of her handmade 18k pave eternity bands (a specialty) or fashionable bangles that I would love to eventually stack. All her pieces of jewelry are so classy yet modern, custom-made, and simply unique. I'm sure you'll find the perfect ring, necklace or bracelet that was handcrafted just for you! And I already have my eyes on this white gold necklace with unique pave links because it'll look fffreaking fffabulous on me, and diamonds are a girl's best friend! 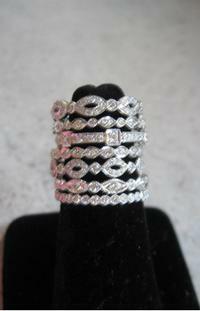 Pictured here are Lisa T.'s most popular stacking bands ($600 each). You can get one at a time and stack'em up!